These images have never been seen before! I was a photography student, taking my very first photography class, and so of course I took my camera along when I decided to spend a couple of days in Los Angeles for my birthday. 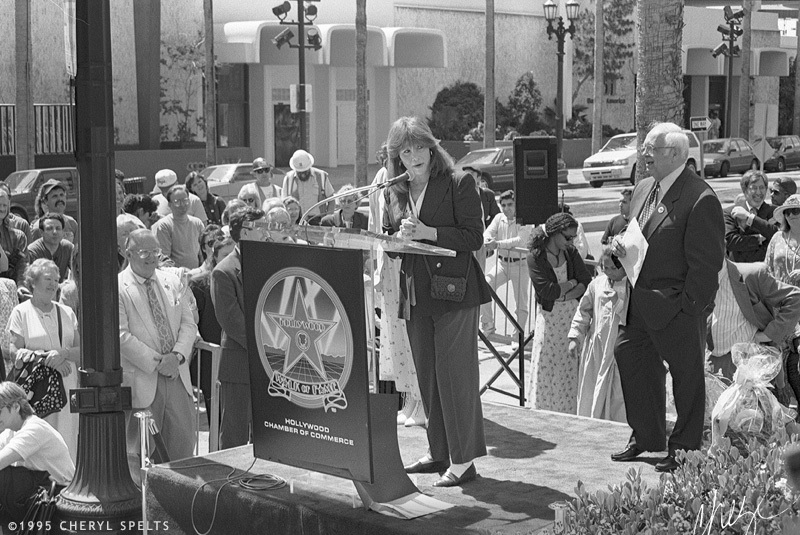 Looking for fun things to do, I saw a blurb in the newspaper about a star unveiling on the Hollywood Walk of Fame for Sharon Gless and Tyne Daly, on March 29, 1995 – so I went! Why did I never share them? Well in 1995 there was no such thing as social media or a blog, so if a photo didn’t fit any of my class assignments, or wasn’t special enough for me to want to work on in the darkroom for some other reason, it never got beyond the negative stage. And frankly even then I knew these are not special – they’re just a step above the snap shots the other tourists were taking with their disposable cameras. So why am I sharing them now? Well I’m going through my negative archive, and scanning stuff that I had forgotten about, partly to document how far I’ve come, and also as sort of a historical documentation of my own history. And honestly? Seeing the fashions and the big cameras? It’s fun to remember what the world was like in 1995! 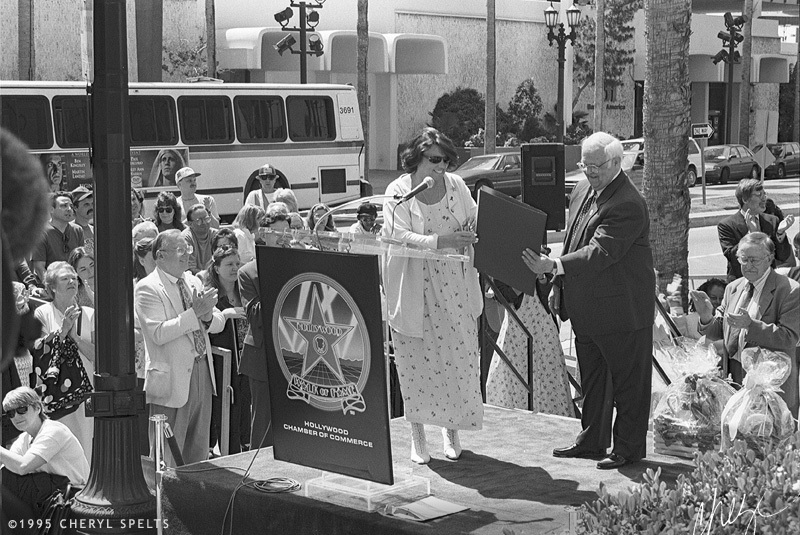 On the day of the event I drove to Hollywood Boulevard, and stood on the sidewalk with the rest of the crowd, and was close enough to see Sharon Gless get her star. But there were so many heads in front of me that I didn’t bother taking a single photo. By the halfway point I decided to try and find something worthy of shooting. 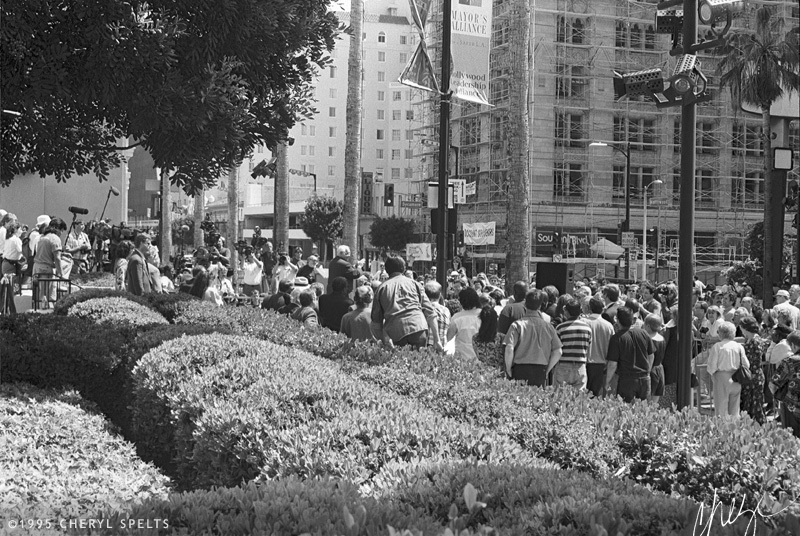 The unveiling was in front of the Screen Actors Guild building, and I found a spot that was up closer to the building, where I could shoot the whole crowd. I got a little closer, and shot the press lined up behind a barricade, ready to jump into action when something interesting happened. When I realized there was nothing standing between me and the guys lined up in the press area, I decided to just join them. With my tiny little 35mm camera and 50mm lens, and wearing a dress! I did not look like those guys, but no one said anything to me, and I managed to get this close to Tim Daly, because it wasn’t the best angle, so no one else really wanted to shoot from there. These guys were right in front, and shooting straight on, so I decided to get a little closer to where they were located. I ended up with a pretty good spot to shoot! I remember I was right next to a camera crew from Brazil. Me, a first semester photography student, with a tiny 35mm camera and even tinier 50mm 1.8 lens, next to a camera crew from another country. I was very aware of them and stayed out of their way, so once they got that I wouldn’t jostle with them for space, they kept flashing me big smiles and we laughed a lot. It was fun! And Tim Daly? At one point he did a double take and pointed at me, and mouthed, “How did you get up there?” and I just shrugged, and he laughed. The outfit he’s wearing may look a little odd in it’s circa-1995-ness, but he was super hot and it was fun to interact with him, even if it was at a distance! 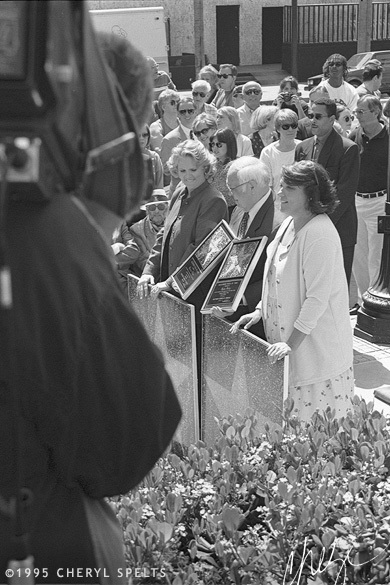 Michele Lee, from Knot’s Landing, speaking about Tyne Daly, who is standing directly behind her. You can just barely see Tyne’s great 1995 boots! And yeah, I had a pair just like them at the time. White perforated leather in a lace pattern, with little pointed toes and pointed heels. 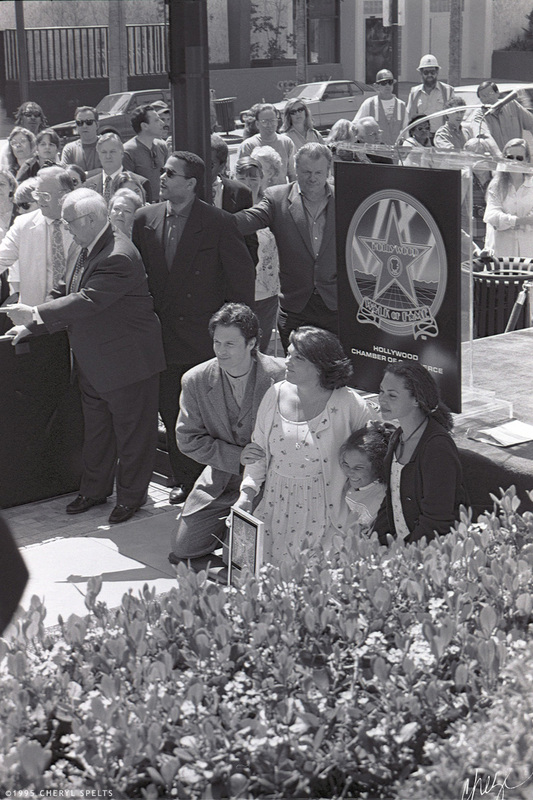 I didn’t know it at the time but the woman in the floral dress and the girl next to her were both related to Tyne Daly, and I think may be her daughters. 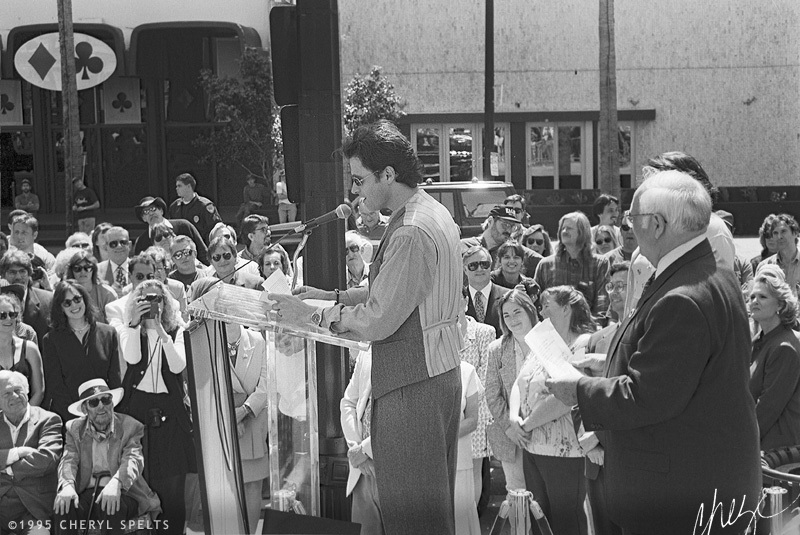 Tyne Daly receiving what I think is the proclamation. 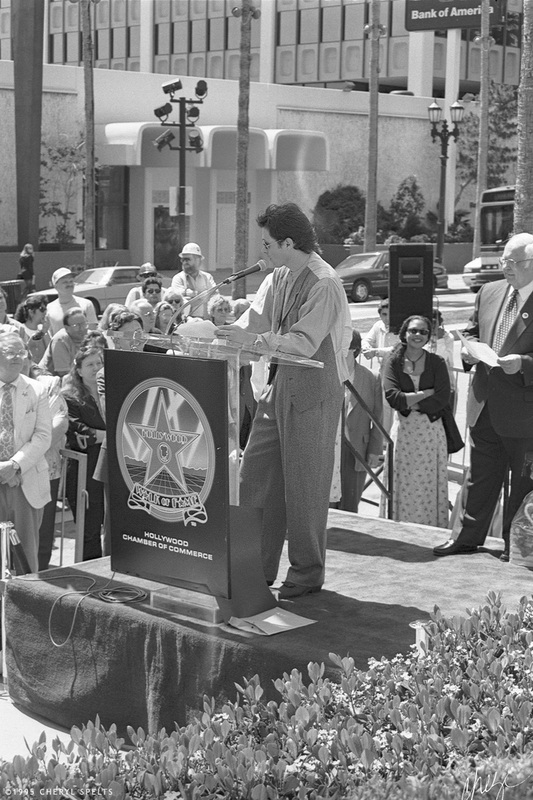 The gentleman handing it to her was the honorary mayor of Hollywood for many years, Johnny Grant. And the woman in the bottom left corner? I kept looking at her, wondering if she was Julie Harris? I never did find out for sure, but it would make sense since she was on Knot’s Landing with Michele Lee, so there was a link. And she was in the inner area, and included in some of the photos, so maybe? 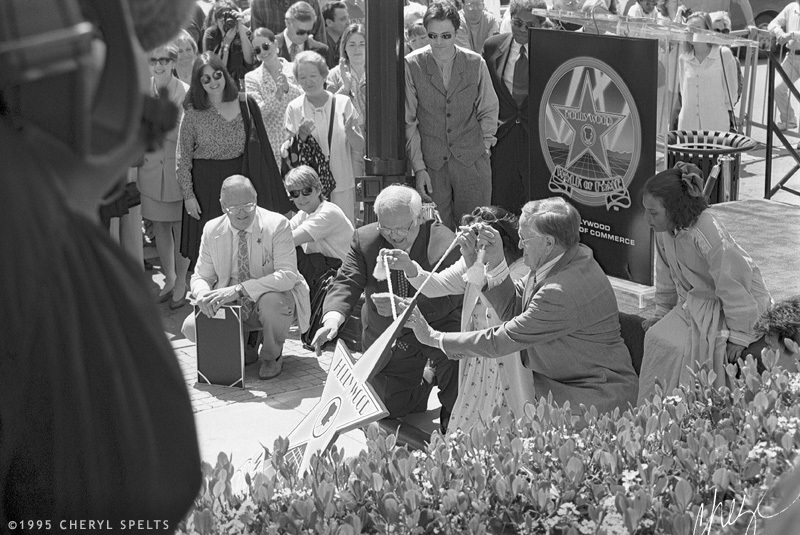 Tyne Daly pulling the cover off her star! The little girl watching is maybe her daughter? And there’s a better shot of the woman I thought might be Julie Harris, sitting on the edge of the staging area, behind Johnny Grant. 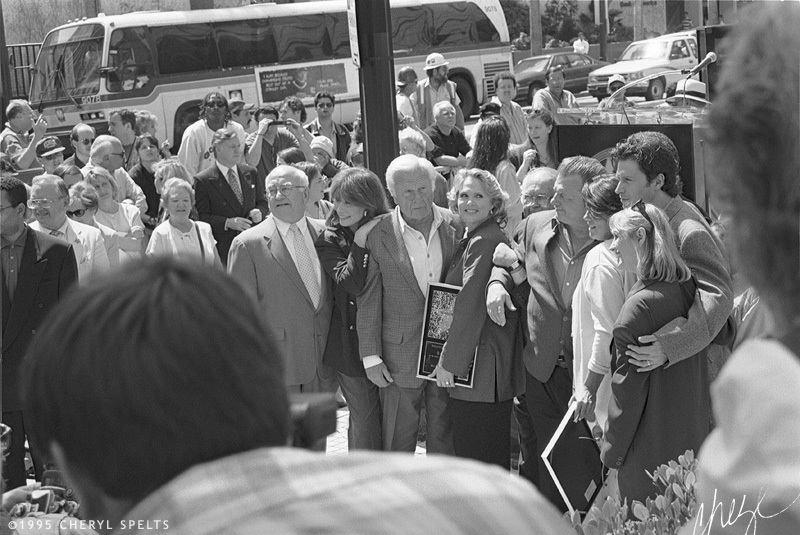 Tim Daly leaning over to see his sister get her matching plague. And look at the guy with the sunglasses and afro, clapping, directly behind Tim. Does he look familiar? 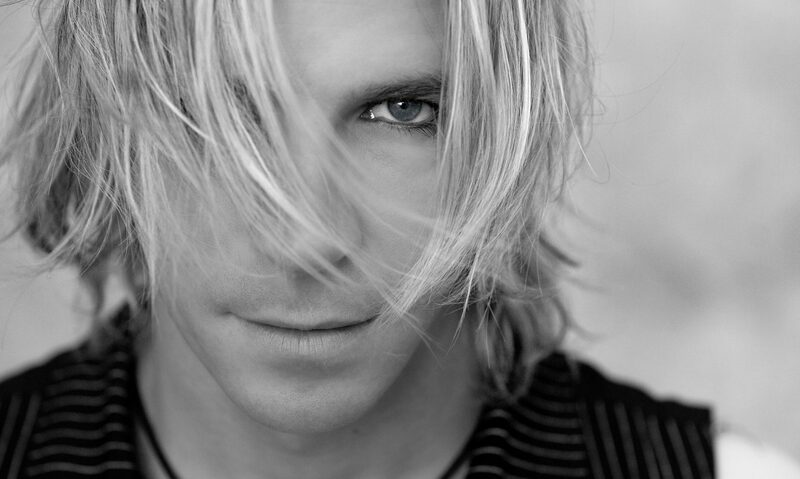 He did to me that day, but I’m still not sure if I should know who he is, or if he’s just an unknown person who just happens to look impressive? But he was in the section reserved for important people, so he may be someone I should know? 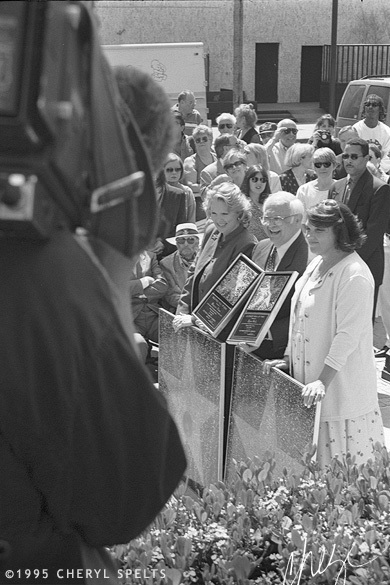 Sharon Gless and Tyne Daly with Johnny Grant, posing with their plaques, in front of their stars. Posing for photos after the ceremony ended. 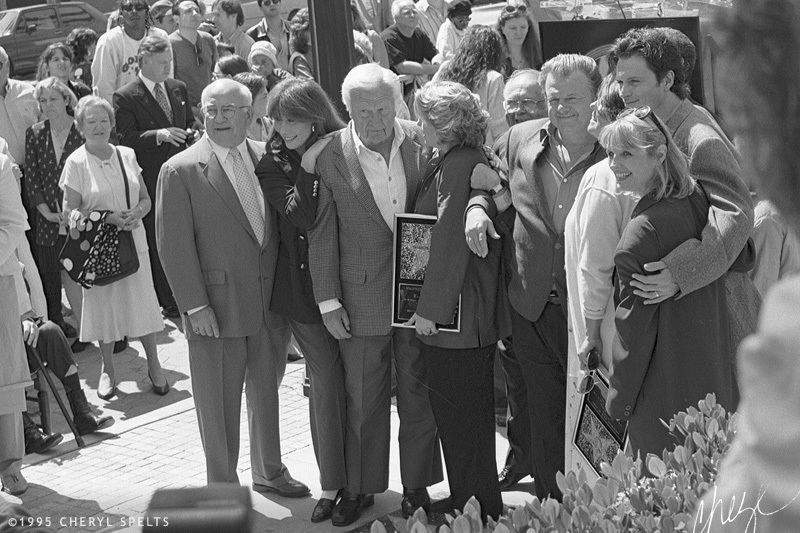 From left to right, Ed Asner, Michele Lee, Buddy Ebsen, Sharon Gless, Johnny Grant, John Karlan, Tyne Daly, Tim Daly, and Kathy Baker. Quite an impressive lineup of TV actors! I love this reporter’s dress! It’s like one of the cast members of Friends or 90210 came out to Hollywood Boulevard and started to interview Tyne Daly! But yeah, we all dressed like that in 1995. In fact, I remember what I was wearing and it was very similar, down to the cross on a black cord, around my neck. 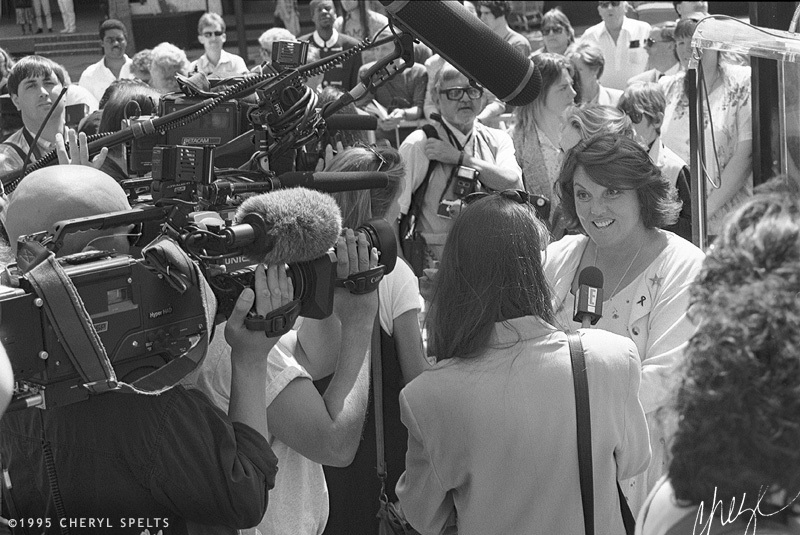 And finally, Tyne Daly being interviewed by E! 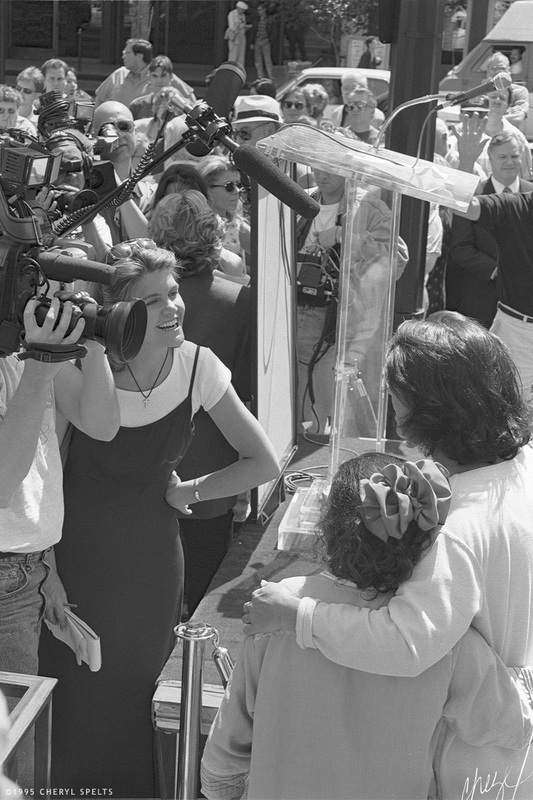 You can see the top of Sharon Gless’ head just behind her, as she’s also being interviewed. My photos skew heavily to Tyne, and there’s not much of Sharon, but it wasn’t intentional. 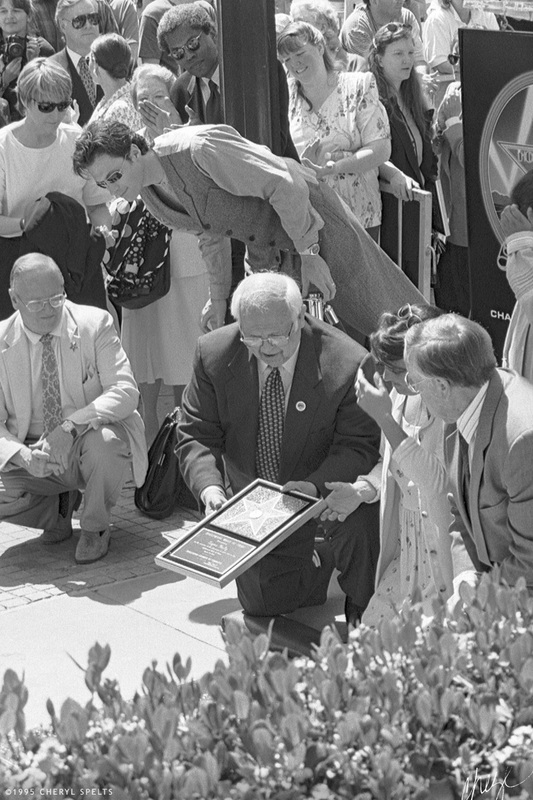 Sharon received her star first, and I was still standing with the crowd on the sidewalk when it happened, and couldn’t see much over the tops of the heads of the people in front of me. I didn’t move until after her unveiling. And once the whole ceremony was over and the two of them posed together, Tyne was just closer to me, and there was no way to get over to where I would have a clear shot of Sharon. Despite how it may look, I was very aware that the real photographers had a job to do, and that I was just a photo student with a basic camera, so I stayed out of their way, and only shot when I wouldn’t be in the way of someone else. And I was lucky, I got some good shots! Not as good as I would have gotten if I’d had a little more experience and maybe another lens or two, or perhaps a press pass… But pretty good for who I was at the time – just a girl with a camera, in her first photography class!